25 Watts of Output Power and NMEA 2000 Connectivity! 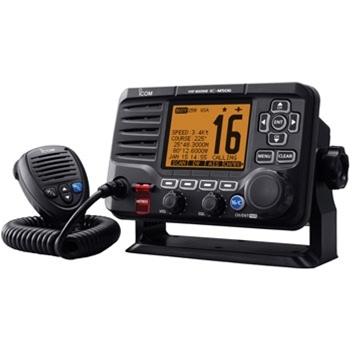 The Icom M506 11 Fixed Mount VHF with NMEA 2000 connectivity leads the way in the vhf marine radio market by offering more features than most other radios available. The IC-M506 features the most Advanced Waterproof housing available from a VHF; IPX8. Designed and tested to survive after being submersed in 1m of water for 60 minutes. The “Last Call” voice recording function automatically saves the last two minutes of incoming calls so you are able to replay previously received calls in case you need to clarify an important incoming call that might have been missed. The IC-M506-11 has a NMEA 2000 port for easier connection to your NMEA2000 compatible chartplotter. That means no more interfacing by cutting and splicing wires. Now just plug and play. The Icom 506 11 is also offers NMEA 0183 connectivity. The IC-M506 also features Icom’s “Active Noise Cancelling technology.” Using its digital signal processor, the built in bi-directional noise cancelling feature improves audio quality both during transmission and receiving. This feature assures you are heard and you can hear when you really need to, such as when weather conditions are poor or if there is a lot of background noise. The new intuitive Icom user interface provides fast and intuitive operation to control its multiple functions. A high-definition dot matrix display allows all information such as GPS, DSC and radio menu’s to be clearly viewed. The option of a second station command mic is also available via the COMMANDMIC IV. Most features can be controlled from the COMMANDMICIV. It can also be used as an intercom between the two. The Icom M506 provides 25W Two-Way Hailer capability. When connected to an external hailer horn, you can talk to people on the deck from the radio’s microphone and can hear their reply via the hailer speaker. Each Icom M506 comes with: 506 Fixed Mount Unit, Hand Microphone, DC power cable, Mounting Bracket, Documentation and a 3 Year Warranty. 2 Min “Last Call” Voice Recording. 25W Two-Way Hailer and Horn. Looking for the same unit, with an AIS Receiver Built-in? Take a look at the Icom M506 21. Icom's SP37 is a 40W Hailer Horn / Speaker for fixed mount VHF Radios. Icom MB75 Flush Mounting Bracket for M502/M504/M506/M602/M604/M605.